Provent Sleep Therapy is now available for patients to purchase from Intus Healthcare through CPAP.co.uk. Provent Sleep Therapy is a clinically proven treatment for Mild to Moderate Obstructive Sleep Apnoea. Two vents cover the nostrils, providing resistance on exhalation which creates positive pressure in the airway. It is intended for use by those who have been unable to maintain compliance with CPAP therapy; instead providing a comfortable alternative. Provent is available in monthly supplies, either individually or through a discounted subscription rate. 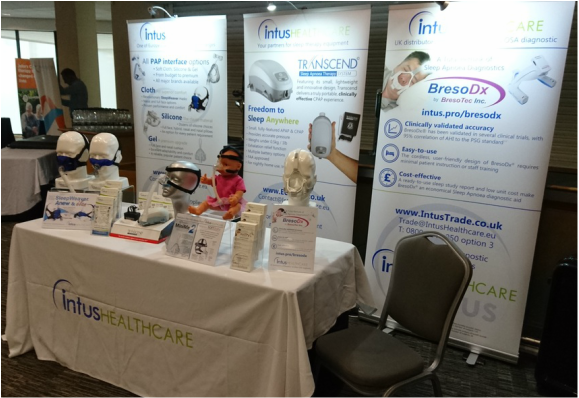 Intus Healthcare and Circadiance LLC have agreed an exclusive distribution agreement, which will see Intus become their sole authorised provider of the SleepWeaver CPAP masks in the UK. The exclusive agreement will allow Intus to better promote and market the SleepWeaver brand, helping more patients achieve the comfort required for successful CPAP compliance. Intus Healthcare have launched a new sleep study reporting service for NHS sleep clinics and hospitals. The service sees the clinic supplied with an innovative BresoDx device for each patient. BresoDx provides accuracy comparable to PSG, with 95% correlation of AHI, but with greatly improved patient comfort and convenience. Intus' service allows clinics to conduct more PSG-level sleep studies at greatly reduced cost. Prices start at £199 per study, reducing to £179 for larger orders. Prices exclude VAT. Thanks to those who came along and supported us at SATAday and ARTP National Strategy Day! 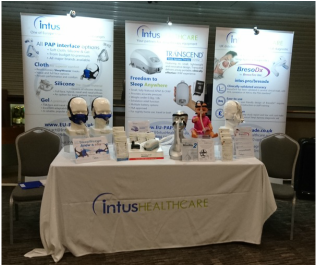 It has been a busy yet exciting week for the team at Intus Healthcare as we exhibited at SATAday and attended the ARTP National Strategy Day! We would like to thank all of those that came along and supported us and we hope that we were able to answer any questions that you had. If you didn't manage to visit our stand, then we would be more than happy to answer any CPAP or sleep apnoea queries that you might have. Just send us an email and we will aim to get back to you as soon as possible. We were pleased by the response we had from sleep apnoea sufferers at the SATAday conference hosted on Saturday 15th October 2016. We hope that OSA sufferers not only benefited from talking to us, but by attending and listening to the talks hosted by leading sleep technicians and CPAP manufacturers. We would like to thank the Sleep Apnoea Trust Association for inviting us to attend SATAday and we couldn't have been more pleased with the outcome. We were able to talk to many OSA sufferers who had concerns about their therapy and were able to point them into the right direction to improve their therapy. If you did attend either the SATAday or ARTP National Strategy Day conferences and have any further questions that you would like to ask, please do not hesitate to contact us and we will be more than happy to offer you advice.